Figure A. APC conjugated mouse anti human CD14 (MCA596APC) and FITC conjugated Mouse IgG1 isotype control (MCA928F). Figure B. APC conjugated mouse anti human CD14 (MCA596APC) and FITC conjugated mouse anti human CD66b (MCA216F). All experiments performed on red cell lysed Human peripheral blood gated on myeloid cells in the presence of Human SeroBlock (BUF070A). Figure A. PE conjugated Mouse anti Human CD24 (MCA1379PE) and FITC conjugated Mouse IgG1 isotype control (MCA928F). Figure B. PE conjugated Mouse anti Human CD24 (MCA1379PE) and FITC conjugated Mouse anti Human CD66b (MCA216F). All experiments performed on human blood gated on single cell granulocytes, in the presence of 10% human serum. Data acquired on the ZE5 Cell Analyzer. Mouse anti Human CD66b antibody, clone 80H3 reacts with the CEACAM8 or CGM6 gene product, from the carcinoembryonic gene family. The CEACAM8 gene product is called CD66b, Non-specific cross-reacting antigen NCA-95 or Carcinoembryonic antigen CGM6. CD66b is a 286 amino acid mature ~95-100 kDa GPI anchored molecule with an N-terminal 34 amino acid signal peptide and a 29 amino acid C-terminal propeptide, shed in the mature form. CD66b is expressed strongly by mature granulocytes and metamyelocytes, and weakly by bone marrow myelocytes. 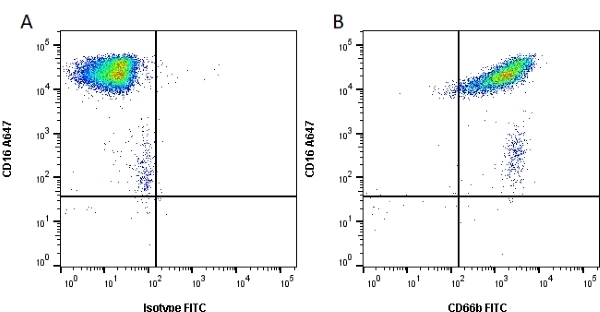 CD66b is not expressed by peripheral blood monocytes or lymphocytes. Human leucocytes from individuals with CML. Spleen cells from immunised BALB/c mice were fused with cells of the mouse MOPC 315-43 myeloma cell line. 1 This product contains sodium azide, removal by dialysis is recommended prior to use in functional assays. Dialysis cassettes EQU003 are suitable for this purpose. 3 See Feuk-Lagerstedt et al. Use 20ul of the suggested working dilution to label 5 x 105 cells or 100ul whole blood. Use 10ul of the suggested working dilution to label 5 x 105 cells or 100ul whole blood. Mannoni, P. et al. (1982) Monoclonal antibodies against human granulocytes and myeloid differentiation antigens. Hum Immunol. 5 (4): 309-23. Ionita, M.G. et al. (2010) High neutrophil numbers in human carotid atherosclerotic plaques are associated with characteristics of rupture-prone lesions. Arterioscler Thromb Vasc Biol. 30 (9): 1842-8. Simard, J.C. et al. (2010) Induction of neutrophil degranulation by S100A9 via a MAPK-dependent mechanism. J Leukoc Biol. 87 (5): 905-14. Feuk-Lagerstedt, E. et al. (1999) Identification of CD66a and CD66b as the major galectin-3 receptor candidates in human neutrophils. Jankowski, A. et al. (2002) Determinants of the phagosomal pH in neutrophils. J Biol Chem. 277: 6059-66. Jinnouchi, A. et al. (2005) Local anesthetics inhibit priming of neutrophils by lipopolysaccharide for enhanced release of superoxide: suppression of cytochrome b558 expression by disparate mechanisms. J Leukoc Biol. 78: 1356-65. Thickett, D.R. et al. (2002) A role for vascular endothelial growth factor in acute and resolving lung injury. Am J Respir Crit Care Med. 166: 1332-7. Sekine, K. et al. (2006) Panning of multiple subsets of leukocytes on antibody-decorated poly(ethylene) glycol-coated glass slides. J Immunol Methods. 313: 96-109. Ottonello, L. et al. (1999) Monoclonal Lym-1 antibody-dependent cytolysis by neutrophils exposed to granulocyte-macrophage colony-stimulating factor: intervention of FcgammaRII (CD32), CD11b-CD18 integrins, and CD66b glycoproteins. Ottonello, L. et al. (2000) Monoclonal Lym-1 antibody-targeted lysis of B lymphoma cells by neutrophils. Evidence for two mechanisms of FcgammaRII-dependent cytolysis. J Leukoc Biol. 68: 662-8. Moraes, T.J. et al. (2006) Abnormalities in the pulmonary innate immune system in cystic fibrosis. Am J Respir Cell Mol Biol. 34: 364-74. Obesity (Silver Spring). 17: 2014-8. Pliyev, B.K. and Menshikov, M.Y. (2010) Release of the soluble urokinase-type plasminogen activator receptor (suPAR) by activated neutrophils in rheumatoid arthritis. Binet, F. and Girard, D. (2008) Novel human neutrophil agonistic properties of arsenic trioxide: involvement of p38 mitogen-activated protein kinase and/or c-jun NH2-terminal MAPK but not extracellular signal-regulated kinases-1/2. J Leukoc Biol. 84: 1613-22. Rosenkranz, A.R. et al. (1999) Novel C5-dependent mechanism of neutrophil stimulation by bioincompatible dialyzer membranes. J Am Soc Nephrol. 10: 128-35. J Leukoc Biol. 87: 905-14. Whitmore, L.C. et al. (2016) A Common Genetic Variant in TLR1 Enhances Human Neutrophil Priming and Impacts Length of Intensive Care Stay in Pediatric Sepsis. J Immunol. 196 (3): 1376-86. Bastian, O.W. et al. (2016) Neutrophils contribute to fracture healing by synthesizing fibronectin+ extracellular matrix rapidly after injury. Dyugovskaya, L. et al. (2016) Intermittent Hypoxia Affects the Spontaneous Differentiation In Vitro of Human Neutrophils into Long-Lived Giant Phagocytes. Oxid Med Cell Longev. 2016: 9636937.